It’s that time again…time for the Tampa Bay Air Fest and all of the awesomeness that it brings! This year’s event will be held on Saturday, March 19, 2016 and Sunday, March 20, 2016. As with previous events, traffic congestion throughout South Tampa will be very heavy, so you will want to leave early and be prepared to brave the crowds…both at the event and while on the road. If you want to avoid the traffic and parking hassles, I strongly encourage you to use transit to get to and from the event. As with many previous events, Hillsborough Area Regional Transit (HART) is partnering with MacDill Air Force Base to provide bus transportation via a modified Route 4. Route 4 normally operates hourly on weekdays only, but will be operating roughly every 15 minutes on both days. The scene from the 2014 AirFest. Photo Credit: HARTride 2012. Escape the traffic hassles! Use HART! Gates will open at 8:00am, but as in years past, you can expect to see cars lining up as early as 7:00am or earlier. Why sit in traffic and worry about if you’ll even get a parking space when you can leave the driving to HART? The Route 4 Shuttle will operate every 15 minutes depending on traffic, with buses running southbound beginning at 8:00am from the Marion Transit Center in downtown Tampa. Northbound buses will begin running at 9:00am from MacDill AFB. Southbound service will end at 3:00pm, or slightly earlier depending on event capacity. Final northbound buses will begin leaving the base at 5:00pm. Buses will follow the normal Route 4 weekday route on both days, but the segment south of Britton Plaza will be modified due to congestion and some normal bus stops will not be served. This is to help keep buses moving and spacing between buses consistent. Please keep in mind that OneBusAway tracking may not be available for this service. Route 19 will operate on its normal weekend route and schedule. Some buses may see delays due to base traffic. Since Route 19 interlines with Route 18 on weekends, Route 18 customers should expect delays in their buses arriving as well. Because of heavy traffic, Route 36 will terminate at Britton Plaza and will only operate its normal route and schedule between Britton Plaza and the transfer point at Fletcher Ave and Dale Mabry Hwy. For Air Fest 2014, I made a map showing the routing of all three above routes. Please keep in mind that the routing of Route 4 could change as it gets closer to the event. Please review HART’s blog post for any additional info. For those driving to the event. For those of you who wish to drive to Air Fest (or are coming in from another county), there will be something different this year. The Dale Mabry, MacDill Ave, and Tanker Way (Manhattan/Interbay) Gates will all open for inbound traffic to help alleviate the heavy congestion that has plagued South Tampa streets in years past. The Bayshore Blvd gate, as in past years, will only be open to military personnel with a valid ID. There is no cost for parking at the event. 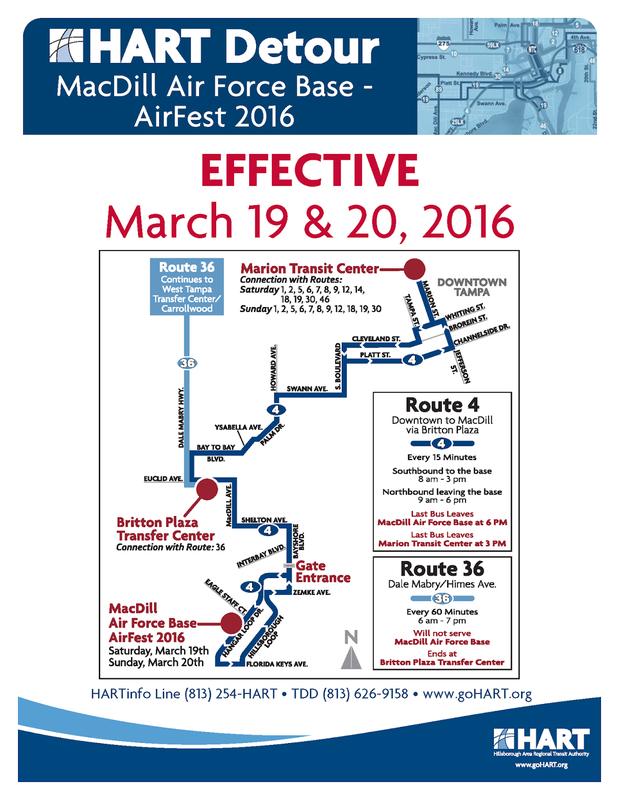 With that said, here’s the main arterial highways that will get you to the AirFest. From Central and South Pinellas County via Gandy Blvd. If you’re coming from the southern Gulf Beaches, south and central St. Pete, and Gulfport, you can use I-275 north to Exit 28 – Gandy Blvd. Travel Gandy Blvd eastbound across the Gandy Bridge until you reach Dale Mabry Hwy (intersection immediately after the Selmon Exwy). Turn right onto Dale Mabry and proceed to the MacDill AFB gate. If you’re coming from Seminole, Largo, and other points within central Pinellas, just follow Gandy Blvd eastbound to Dale Mabry Hwy (intersection immediately after the Selmon Exwy). Turn right onto Dale Mabry and proceed to the MacDill AFB gate. From Northern Pinellas County and Western Pasco/Hernando/Citrus Counties. Those coming from Clearwater, Tarpon Springs, the northern Gulf Beaches and other points north can use either the Courtney Campbell Causeway (SR 60 east) and follow the signs to Kennedy Blvd (SR 60 east). Continue along Kennedy until you reach Dale Mabry Hwy (US 92 west). Turn right onto Dale Mabry and proceed to the MacDill AFB gate. Alternatively, you can use Gandy Blvd eastbound to Dale Mabry Hwy southbound. From Northwest Hillsborough County, Central Pasco/Hernando Counties, and Eastern Citrus County via Dale Mabry Hwy. If coming from West Tampa, Drew Park, Carrollwood, Town-N-Country, Citrus Park, and Lutz, you can simply use Dale Mabry Hwy southbound until you reach the MacDill AFB gate. If coming from central Pasco County and northward, proceed on US 41 south until you reach Dale Mabry Hwy (SR 597) southbound. Fork right onto Dale Mabry and proceed southbound until you reach the MacDill AFB gate. An alternate to the northern portion of Dale Mabry is the Veterans Exwy/Suncoast Pkwy. Use the highway to reach Kennedy Blvd (SR 60) east. Then proceed on Kennedy until you reach Dale Mabry Hwy (US 92 west). Turn right onto Dale Mabry and proceed to the MacDill AFB gate. PLEASE KEEP IN MIND that the Veterans Exwy/Suncoast Pkwy are TOLL ROADS! From Northeast Hillsborough County and Eastern Pasco/Hernando Counties. If coming from the New Tampa and USF areas, you can use I-275 south towards downtown Tampa. Be sure to follow the signs towards St. Petersburg when approaching the I-4 junction. From there, use Exit 41A/B – Dale Mabry Hwy southbound (US 92 west). Turn left onto Dale Mabry and proceed south to the MacDill AFB gate. If coming from eastern Pasco and Hernando counties, use I-75 south to I-275 (Exit 274) south and follow the directions above. After merging onto I-275 south, travel to Exit 41A/B – Dale Mabry Hwy southbound (US 92 west). Turn left onto Dale Mabry and proceed south to the MacDill AFB gate. Alternatively, you can use the I-4/Selmon Connector (I-4 Exit 2) to connect to the Selmon westbound and exit off Gandy Blvd east (Exit 1A). From there, turn right at Dale Mabry Hwy south (very first light as soon as you get off the expressway) and proceed to the MacDill AFB gate. PLEASE KEEP IN MIND that the Selmon Exwy (including the Connector from I-4) are TOLL ROADS. From Eastern Hillsborough County, Polk County, and the Orlando Area via I-4. If travelling along I-4 towards Tampa from East Hillsborough and beyond, simply follow the signs to I-275 south to St. Petersburg. Once on I-275, After merging onto I-275 south, travel to Exit 41A/B – Dale Mabry Hwy southbound (US 92 west). Turn left onto Dale Mabry and proceed south to the MacDill AFB gate. From Southern Hillsborough County and Manatee/Sarasota Counties via I-75 and the Selmon Exwy. If coming from South Hillsborough County and points southward, use I-75 north to the Selmon Exwy (Exit 256) and proceed through downtown Tampa to Exit 1A (Gandy Blvd East). From there, turn right at Dale Mabry Hwy south (very first light as soon as you get off the expressway) and proceed to the MacDill AFB gate. PLEASE KEEP IN MIND that the Selmon Exwy is a TOLL ROAD. If you do not wish to use the Selmon, you can use SR 60 (Exit 257 from I-75 north) and proceed through the Channelside District and downtown Tampa to Bayshore Blvd via Channelside Dr and Brorien St. Turn right from Bayshore Blvd to Bay to Bay Blvd, and then left on Dale Mabry Hwy. Proceed south on Dale Mabry until you reach the MacDill AFB gate. From Manatee/Sarasota Counties via I-275 and Gandy Blvd. If you use I-275/Sunshine Skyway from Manatee County, proceed northbound on I-275 to Exit 28 – Gandy Blvd. Travel Gandy Blvd eastbound across the Gandy Bridge until you reach Dale Mabry Hwy (intersection immediately after the Selmon Exwy). Turn right onto Dale Mabry and proceed to the MacDill AFB gate. For those using bicycles, roller blades, etc. Although bicycles, roller blades, etc. are acceptable modes of transport to the base, they are not allowed on the flight line (the zone within the gated event area). Bike racks will be provided near the event gates so that you can lock up your bike securely. Those using roller blades, etc. should have a backpack to stow them away in (large tote bags are not allowed at the event). Be sure to NOT bring anything with you that wouldn’t be allowed through an airport security checkpoint. Other tips to keep in mind. ARRIVE EARLY! Gates open at 8:00am on both Saturday and Sunday. However, lines of cars will start forming even before 7:00am. If you’re driving from another county, or using the HART bus system, please plan your trip accordingly. For HART Customers, you can use the OneBusAway app for real-time bus arrival times. LIMITED PARKING. While parking is free at the event, there are only so many spaces available. Once all of the designated parking lots are full, base officials will close the Dale Mabry gate to all arriving traffic. This is why it’s strongly encouraged to use the HART bus system and its convenient Route 4 Shuttle Service. PACK ITEMS CAREFULLY. While you definitely want to make sure you have water with you, please be considerate of what you take with you to the event. The event gates, as in years past, will have a tented airport-style security checkpoint. Basically anything that prohibited at the airport will be prohibited at the event (including firearms). Coolers, glass containers, pets (except service dogs), and fireworks are also prohibited. Any further questions or concerns regarding the AirFest should be directed to MacDill AFB officials. Questions or concerns about transit services should be directed to HART Customer Service. HART can be contacted at 813-254-4278. Official Air Fest Webpage | Official MacDill AFB Facebook Page. Enjoy the Air Fest weekend!